Harriet and Efrem have been interviewed about Chinese Traditional Medicine (CTM), Traditional Chinese Medicine (TCM) and acupuncture. 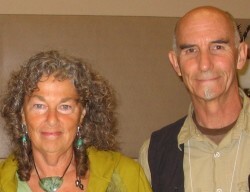 They discuss the differences between Western and Eastern medicine, sharing insights gained from many years of practice. Alternative Therapies: You have both been practicing Chinese medicine a long time. In your estimation, what does Chinese medicine do? it emerges from a lived life. Efrem Korngold: Its overarching goal is to cultivate people’s capacities and to correct whatever underlying disturbances are causing distress. In order to achieve this, it’s useful to investigate how a disorder arises so that the process can be disassembled and reorganized, not merely masked. This noble goal is not always attainable, but the medicine compels us to strive for it. In Chinese medicine everything is linked with everything else – not just as an idea, but in actuality. Health and illness coexist and arise out of the same conditions. Disease doesn’t come from nowhere, it emerges from a lived life. Simply put, Chinese medicine not only focuses upon the content (the disease), but also the context (the person who has it). Harriet Beinfield: There are several legitimate languages to use in talking about Chinese medicine – the scientific one of measuring electrical skin resistance at acupuncture sites, the release of peptides and hormones stimulated by the needles, the pharmacology of herbal compounds. There’s also the qualitative, clinical language of whether people feel they’ve been helped – outcome studies. On the one hand, Chinese medicine is a method of restoration and recovery. On the other hand, it’s a systematic way of knowing, a medical epistemology that includes a method of self-exploration that helps people develop in less tangible ways than taking herbs, receiving acupuncture, or following a new diet. and assist them in fulfilling their destiny.